They’re an odd bunch. John Lundberg, the chief author of the site, emailed me once because I'd accused him of being a disinformer on the DarkConspiracy forum. In reflection I think I was being a bit harsh on him. I’ve no grounds to accuse him personally, and I don't see anything wrong with the plankers’ kind of landscape art (except for the damage it does to the farmer's field, although the farmers can make more than a compensating few bob off them if they know what they’re doing! ), but there's no doubt that the circlemakers' activities is leading people to wrongly believe that every crop circle is made by the plankers. Even the plankers themselves don't claim that they've made all of them, although they water it down a bit; words to the effect of: "Well, no we don't know who made that one, so there must be circle-making gangs that we're not in touch with." (Matthew Williams- CFZ Weird Weekend 2006) The plankers are actually every bit as much “New Age” and "freaky" as most of the “croppies”, people like me who study crop circles as a paranormal phenomenon! They regularly report paranormal activity while they're making the circles. They carry out pagan ceremonies at their circlemaking sites too. There's no doubt that some of the circles are made by the plankers, some even reckon it is the majority, but anyone who looks a little deeper will see that human activity cannot possibly account for the whole phenomenon. But how many people look deeper? Don't most people just switch off after reading stuff like the above picture? 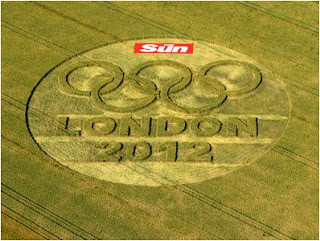 Does anyone look into the Leavengood Investigation, Lucy Pringle, Michael Glickman and all the other researchers who’ve concluded that the crop circles are not all man-made? Why doesn’t The Sun, "the People's Paper" report that? Without accusing John Lundberg as a person outright again, it still pays not to underestimate the capacity of psyops and government disinformation. We’ve already seen, in other manifestations of the supernatural and otherworldy, that the authorities deliberately seed lies to put people off the scent of them: (EG:http://hpanwo.blogspot.com/2008/03/roswells-galore.html ). They seem to have an almost knee-jerk aversion to strange phenomena, for whatever reason (which I explore elsewhere). Crop circles qualify as part of that department and I'd be far from surprised if the government initiated very broad and convincing propaganda to try and suppress the truth. Hello, stranger! Dr Livingstone I presume. Yeah, I'll have to take a trip or two down to Moonraker Land and go circle-spotting. Have a pint or two at the Barge and a coffee at the Silent Circle. I'm going to see David at Brixton next week. I would like to have seen DI myself, though I was a little late on the uptake. I notice he has a new DVD coming out- Live at the Oxford Union. Did you know he was in town? Did you get to the show? Still I'm going to get the DVD of it.